Hey, hey—that’s me! See my hand waving in the wind? I’m one of 8.6 million single American moms. I don’t feel so alone now. The Expedia television ad highlights a mom and her 10-year-old son reading a bedtime story and then books a European vacation to Venice, Italy and Great Britain to live the story of the child’s fairy tale. The answer is, very few. With women still earning only 77 cents for each dollar a man earns, the likelihood of booking a European trip is well, highly unlikely. And even though your “mom” in the ad is white and probably has college diplomas hanging on her office wall, which stereotypes her into a higher income bracket, Expedia still misses it. Did Expedia’s agency use their summer interns to develop this ad concept? I can just see it: The creative director pulls his interns and junior account managers into a conference room with white boards, flip charts and colored markers. Now, I’ll bet my (empty) savings account that these Millennials have no idea the plight of the single mom. Now, it’s likely a few of these “wet behind the ears” marketing graduates were raised by a single mom, but they still can’t conceptualize the day-in and day-out difficulties of supporting and raising a child or children on your own. I’m a single mom with the college degrees. I was fortunate to backpack across Europe before marriage and a child. Now add in divorce, home foreclosure, job loss and a depleted retirement account and you have another single mom statistic. Maybe one day, I’ll be able to squeeze out some coin and show my son the wonders of traveling to far off lands. 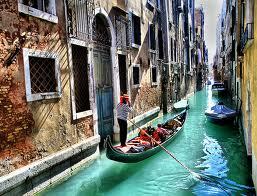 We might even stay overnight in a castle or take a gondola ride through the watered streets of Venice. Or maybe, we’ll just open a book and read about our dream destinations. That’s what fairy tales are for, right?